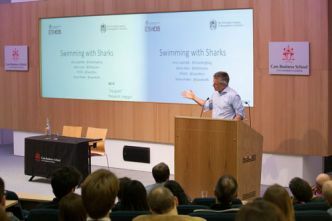 Investigative journalist Joris Luyendijk entertained students, staff and guests with his anecdotes about ‘swimming with sharks’ in the banking world at an event organised by ETHOS: The Centre for Responsible Enterprise. at Cass Business School. Mr Luyendijk talked about how few people read the financial pages of newspapers, because quite often it can be like an English-speaker reading a Portuguese newspaper. Articles, he said were “by insiders, for insiders, about insiders”. He immersed himself in the City for a few years, speaking to over 200 people for a Guardian blog - from investment bankers and elite hedge-fund managers to regulators and back-office staff. He struggled to recruit informants, so offered interviewees full anonymity and control. He said: “I spoke to one banker who said, I agree with more regulation – but the problem is that regulators are idiots, so we used that as the headline and within 24 hours I had two regulators. “The really interesting step was when I spoke to someone in human resources. She said, my job is to fire people after they’ve spoken to the press, and here I am. “What came back time and again in the interviews was the culture of fear that happens when you have a zero trust system. People say they work-at a bank, not work-for. “I went in thinking – like we all do – that bankers are evil people. But I think we’ve been really fooled and led astray. Mr Luyendijk was followed by Cass researcher and former banker Zahira Jaser who talked about her time on the trading floor. She said: “Thank you Joris for showing a different perspective of bankers that we don’t see very often. You have brought to our collective awareness that bankers are humans. “You cannot become attached to your colleagues because they might disappear. I’ve never really said these things in public before because there isn’t really a forum. More information about Mr Luyendijk’s book, Swimming with Sharks can be found here. See what was tweeted about the event at #swimmingwithsharks.